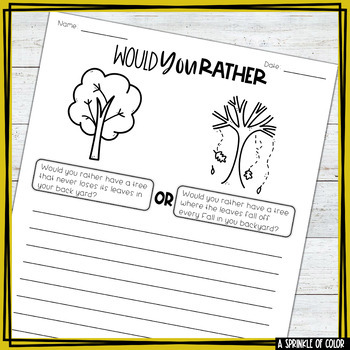 5 Would You Rather writing prompt worksheets for FALL AUTUMN fun. Students will write a paragraph and give reasons. Full week of writing Prompts. 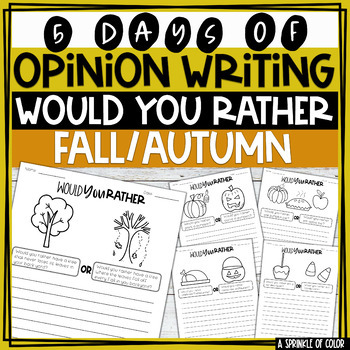 → Students who are working on opinion paragraph writing. → Students can write a paragraph on the writing prompt. → Can write an essay using the extension page. → Great to use with R.A.C.E. writing strategy because the prompts are written as questions. → Students will need coloring pencils, markers, or crayons after they are done writing. 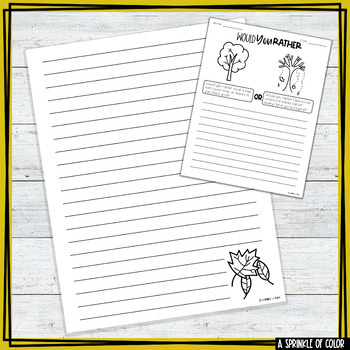 → Students can use scratch paper or white boards to plan their writing. → Use to display student work on bulletin boards. 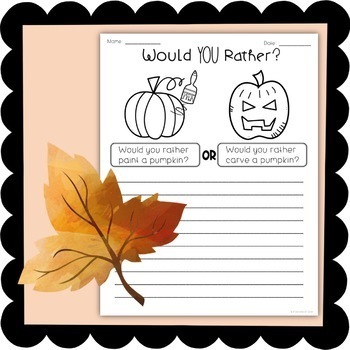 → Fun seasonal activity for students! → Great for displaying student work because it adds color to your walls. → Students can show their individual styles with their color choices. → Easy to use for differentiation. → Flexible and easy to use. → Can be used for a full week (5 days) of writing.